Nickelodeon is all set to reduce the exam stress of kids with new doses of entertainment with their favourite Nicktoons Rudra and Shiva! Presented by Alpenlebie Juzt Jelly, the immersive school contact programme will reach out to 250 schools across cities, Mumbai, Delhi, Bengaluru, Hyderabad, Ahmedabad, Surat, Pune, Aurangabad and Kolkata. Presented by Alpenlibe Juzt Jelly Nickelodeon’s Rudra Boom Chik Chik Boom will bring alive the magic of Rudra into the classrooms with a series of fun and interactive games. The four week long campaigns will see Rudra spread his magic in schools across four cities – Mumbai, Delhi, Bengaluru and Hyderabad. 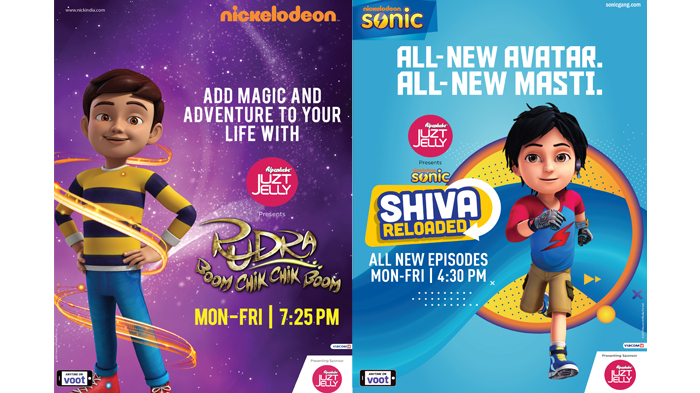 The franchise’s school contact programme will also find Sonic’s Shiva don a new avatar and make school time before exams fun and refreshing with SHIVA Reloaded, also presented by Alpenlibe Juzt Jelly. This initiative will see Sonic’s super kid Shiva make school exciting by engaging kids through various inter-activities. The four-week long school activity of Sonic will cover cities – Pune, Ahmedabad, Surat, Aurangabad and Kolkata.